Part 4. Project 4. Research Point. Look for historic and contemporary artists whose work involves the underlying structure of the body. Leonardo da Vinci was a scientist as well as an artist. He was fascinated by how things worked, whether it was a machine or a human, and spent a lot of time dissecting corpses and drawing the structures of the human body, making copious notes. Did this work influence how he painted? This beautiful portrait of Cecilia Gallerani shows signs of Leonardo’s observations on the human body, especially in Cecilia’s hand which is observed in detail. The form of the ermine is also very well observed. Having recently looked at foreshortening, I can see Cecilia’s hand comes towards the viewer looking proportionally large compared to her face. Cecilia’s neck and face are incredibly smooth and unlined. Her face, neck and shoulders show no real sign of the muscles and tendons observed by da Vinci in his anatomical studies. 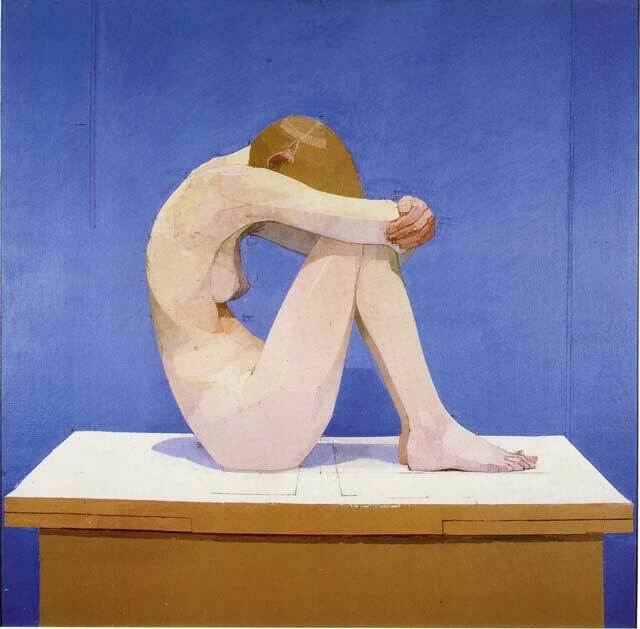 Modern British artist Euan Uglow painted nudes which he measured in painstaking detail. He worked from life and left the remains of his measuring marks on the canvas. His clinical approach creates a strange otherness. A minutely observed human who is somehow other than human. Interestingly, like da Vinci, Uglow’s models are smooth and unblemished. Margaret Evans pregnant 1978. Alice Neel. American artist Alice Neel painted the people who lived around her in poor neighbourhoods in New York. She also painted female nudes. Her portraits focused less on anatomical accuracy and more on the personalities of the people she was painting through capturing their expressions, gaze and in the non-nudes, their clothes. It is interesting that a painting which is less anatomically accurate can be a more accurate portrait of a human being. Neel was especially keen on the unsymmetrical eye. In her portraits, one eye almost always looks higher than the other, and she revels in the unsymmetrical nature of a human face and body. Previous Previous post: Part 4. Project 2. Research point. Foreshortening.